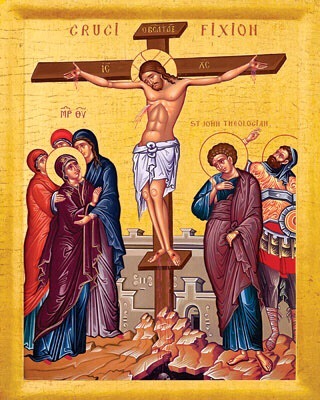 O (Observation): A perceived sign of weakness is seen here in Jesus, who chooses not to remove himself from the cross. Jesus is derisively called the Christ (the Messiah). This ridicule shows the folly of the mockers, for Jesus is indeed the Messiah…albeit a different Messiah than expected. This Messiah chooses to embrace the judgment of the world in order to overcome the judgment that humanity has doled out…to show the folly of this type of judgment…to show mercy to the world, which doesn’t deserve it. Jesus undercut the powers of the world by allowing himself to be turned over to those powers, and ultimately, overcoming those powers through the hope of the resurrection. A (Application): Fear makes us false prophets. Fear make us see a future that will most likely NOT occur. Jesus ended up on the cross, because people feared that Jesus would tear apart their religion for the worse. Well…they were right about one thing: Jesus would tear apart their religion…but only in order to set it back on the right track. We fear much in regards to our religious views, because our world seems like it will be torn apart. This means we need much in the way of vision, time, and grace, for God to work in us. We may mock the way Chrisitan leaders move us and challenge us to love our neighbor, but when we do, let us keep in mind Jesus on the cross. His suffering served the purpose of overcoming our fears and our sins…and to set us on the path to mercy and love. What is challenging you today? How is Christ’s mercy renewing you this day? P (Prayer): Lord, when we mock, extend your mercy. When you tear down our earthly notions, build us up with your Spirit. Amen. This entry was posted in Digging Daily and tagged Cross, False, Fear, Grace, mercy, Vision. Bookmark the permalink.